Homelessness and Respiratory Health – A Matter of Life and Death. 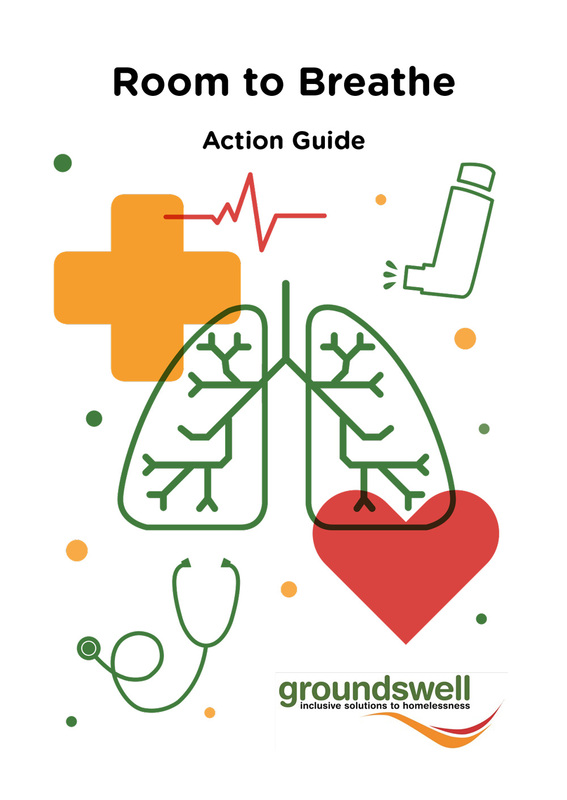 Groundswell’s new study – Room to Breathe – reveals the incredibly poor respiratory and lung health of homeless people. Rates of diagnosed respiratory health conditions and lung disease were dramatically higher than the general population – it is very likely that high levels of undiagnosed issues are also present among homeless people in London. A key factor is the high rate of smoking tobacco and illicit substances. Half of homeless people who currently smoke want to quit but support is not meeting the needs of this group. Groundswell calls on homelessness and health commissioners and services to take action to tackle this issue. If you are homeless and are worried about your breathing or lung health check out our Action Guide. This self-help guide offers practical advice and steps you can take to improve your breathing health based on our findings from the research. It includes a poster that can be put on the wall of your service. The guide is designed to be printed on an A3 printer and folded down to A6 paper size. Groundswell have recently conducted a Peer-Led Health Audit exploring the respiratory health of homeless people Room-to-Breathe. The project has revealed the shocking extent of health inequality experienced by homeless people. Groundswell engaged over 330 people currently experiencing homelessness through focus groups and one-to-one survey based interviews – exploring existing health conditions and access to services. 64% of participants who had slept rough reported to have had chest infections. 26% of participants use an inhaler compared to 8% in the UK general population. 20% of participants report to suffer with asthma compared to 8.4% in the general population. A key factor in the incredibly poor respiratory and lung health of homeless people is the high rates of smoking tobacco and illicit substances. 85% of participants are current smokers. This compares to 18% across the UK. 35% have smoked crack cocaine regularly in the past and 15% currently smoke crack cocaine regularly. Half of current smokers want to quit smoking. A similar figure to smokers among the general population, but support is not meeting the needs of this group. The scale of the problem and the support needs of people experiencing homelessness mean that new approaches are needed to tackle this issue. Groundswell have established a task group of experts in respiratory health from the London Respiratory Network and Pan London Airway Network and staff from Pathways, St Mungos and Find&Treat. We are supporting partner organisations to pilot new initiatives to tackle the issue including Respiratory testing in Homeless Services and support-to-quit initiatives. Room to Breathe was generously funded by Trust for London.